Debt Crisis and Stock Market Trend, Is it 1998 All Over Again? That's the question we're asking in tonight's report in light of developments in the euro-zone and, to a lesser extent, within the investment banking sector. Thursday's headline in the Wall Street Journal proclaimed, "Debt crisis hits Spain." The implication is that the recent downgrade of the sovereign debt ratings for Greece and Portugal have now spread even further into Europe and could continue to spread into a general euro-zone wide debt crisis. When I saw Thursday's WSJ headline concerning Spain, I was struck with the thought that I had seen this scenario played out sometime in the past. After a little pondering, it finally occurred to me that the variables we're seeing set up right now are, in some ways, similar to the situation we saw in the spring of 1998. Let's start with the cyclical backdrop. The similarity between '98 and today can be seen in the yearly Kress cycle configuration. In 1998 the 6-year cycle had bottomed two years prior in 1996. Also, 1998 was the year the 4-year bottom was scheduled for late September/early October, which definitely came into play in the late summer of that year. In 2010 we are two years removed from the 6-year cycle bottom (in 2008) and this year is also when the 4-year cycle is scheduled to bottom in late September/early October. The second parallel is seen in the fact that the so-called "Asian contagion" was raging in the spring of 1998. This was how the press described the Asian currency crisis that was garnering lots of headline attention back then. U.S. financial markets mostly shrugged off the Asian contagion in the spring of '98, though there were definite concerns among investors. The S&P 500 had been in an uptrend that year and was coming off the lows of the October '97 mini-crash. A brief sell-off in January '98 accompanied the news of Bill Clinton's impeachment proceedings over the Monica Lewinsky scandal, but the market quickly regained its composure and zoomed ahead to new highs into April '98. The SPX stalled out in April as fears over the Asian contagion became more palpable and the S&P continued its lateral trading range into the middle of June before breaking out to a new high in a magnificent final flourish. Then came disaster as the meltdown of the Long Term Capital Management (LTCM) hedge fund sent the U.S. stock market reeling in July. Making matters worse was the announcement of the Russian Ruble crisis and the intensification of the Asian currency crisis. Before long commodities were in a freefall along with the stock market and for a while it seemed the entire global economy was coming apart at the seams. The S&P lost just over 20% in the period between mid-June and early September, which technically qualified as one of the shortest "bear markets" on record. All of the disastrous developments in the spring and summer of 1998 took place within the context of a powerful equities bull market in the U.S. The 4-year cycle bottomed in October 1998 and from there it was off the races as the stock market zoomed ahead in the final three months of '98 and retraced all its losses from the prior months. The S&P ended up closing at its all-time high at the end of the year and in no time it all the various crises that dominated the news headlines in the previous months were all but forgotten. Now let's return to 2010. We've already seen the cyclical parallels that exist between then and now. The news headlines aren't quite the same but there are definite similarities. Instead of emanating from the Asian Pacific region we find the euro-zone is where the latest crisis is being played out. The press has even taken to calling the emerging debt crisis in Europe a "contagion," just as in 1998. A growing number of countries are becoming involved in this spreading "contagion" as was true in '98. And against the backdrop of this debt crisis we have a potential parallel to the Congressional trial of Bill Clinton in '98, namely high-profile federal investigation of the Goldman Sachs mortgage trading fraud. It's a well known truism that "no two snowflakes are exactly alike" and neither are there ever two exact repetitions in stock market patterns. Yet I find it of more than anecdotal interest that the trading pattern of the S&P 500 Index in the first four months of 1998 is eerily reminiscent of the SPX in the first four months of 2010. Let’s take a look at the chart from January-April 1998 that follows. Now compare this to the first four months of 2010 and notice the similarities. Now what can we divine from the foregoing exercise in comparing the situation in 1998 with today's? If the euro-zone crisis continues to gain traction, we'll probably see an increase in market volatility and more churning in the broad market indices, similar to what occurred in the spring of '98. The market essentially was flat for the month of May in '98 and for the first half of June before blasting off one last time ahead of the mini-bear market that began that summer. I have no way of knowing whether we'll see a repetition of the May-June '98 pattern but again the similarities thus far are amazing. The final "hard down" phase of the current 4-year cycle most likely won't exert its presence on the stock market until around July, just as it did in 1998. If this 1998 scenario does indeed play itself out from here, we'll obviously need to be on the lookout for a major market top this summer. The Wall Street Journal reported on Friday, "As investors scramble to protect themselves from the next credit flare-up in Europe, their worries are spreading to the U.K." According to WSJ, investors bought a net $443 million of credit-default swaps to insure against a U.K. default last week, which took the total outstanding to $8.2 billion, or roughly matching that of Greece. 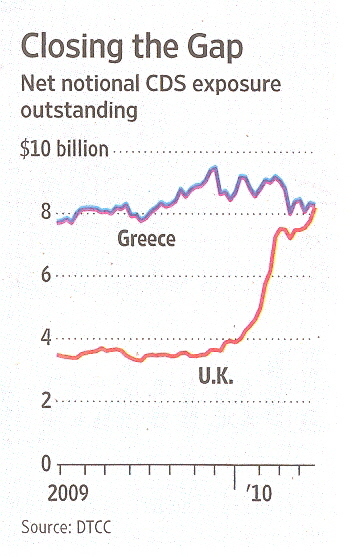 Here is the graphic depiction of the narrowing spread between Greek and U.K. credit default swaps. So there are reasons for expecting the crisis could spread in Europe and come back to temporarily haunt U.S. investment markets later this year, much as in 1998. Now what about the gold stocks? Back in 1998, the XAU Gold Silver Index was in an uptrend thanks in part to the powerful broad market momentum that characterized the broad market for shares at that time. The XAU made a mighty leap forward in April '98, then promptly collapsed in May as the gold stock decline preceded the broad equities market by about 10 weeks. At that time, the secular bear market in commodities was in its final "hard down" phase and accordingly, gold didn't have the benefit of a rising long-term uptrend as it does today. Currently, the gold stocks are the strongest of the major industry groups according to the gold stock internal momentum indicator series, which measures the incremental demand for gold stocks. This is in contrast to 1998, which saw tremendous crossing currents within the gold and silver share group in early spring, a prelude to the carnage that soon followed in May. Assuming the 4-year cycle exerts a strongly negative influence on the broad market later this summer as it did in summer '98, it wouldn't be surprising if gold stocks entered the final "hard down" phase of the cycle in the strongest relative position of all the major sectors. This would be essentially the opposite of what occurred in the summer of '98. As was the case in '98, one of the most important moving averages that traders watch is the relationship between the XAU index and its 60-day moving average. The 60-day MA takes on increased significance when any of the major Kress cycles enter the "hard down" phase and a break in the 60-day MA, if it occurs within 4-5 months of the yearly cycle bottom (late September/early October) typically marks the commencement of a major sell-off.